The 99 Cent Chef is pleased as plantains to present a new video featuring the culinary exploits of L.A.'s favorite taco truck impresario Pedro Pe. The 99 Cent Chef tracks down Pedro Pe and goes along for a ride and ends up in the kitchen, where Pedro Pe works his magic. Pedro has more energy than chile piquin flavored popcorn in a popcorn machine. Ladies and gentlemen, allow me to introduce you to Pedro Pe and his delicious lunch truck specialty -- Shrimp Quesadilla. While pan is heating, assemble quesadilla by smearing tortilla with refried beans -- add cheese, shrimp and chopped green onion. Fold in half and heat in pan until "queso is nice and melted and gooey and tortilla is nice and brown," to quote Pedro Pe. 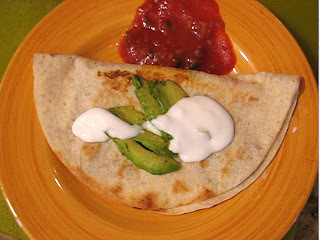 Garnish quesadilla with sliced avocado, a dollop of sour cream and salsa on the side. Pedro Pe, "Mexico's Rich Little" has been performing onstage since 1995. Actual fans include Milos Forman, Nora Dunn, Will Ferrel and Alex Borstein. Pedro appeared regularly as a company member in L.A.'s Acme Comedy Theatre, at the Austin Comedy Festival and at The Montreal Comedy Festival - where he was featured on a bill with Dave Chapelle and Will Ferrell. 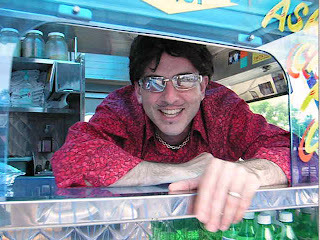 To see Pete's other hilarious videos, click here, and The Chef's video teaser with Pedro Pe is here. To view or embed video from youtube visit here. with carne asada is to die for! I love you 99cent Chef! I want to have your...recipe! I came to the blog for a recipe and stayed for the comedy. To be honest, I was interested in another recipe, but your shrimp quesadilla video is so hilarious I probably won't be able to get that recipe out of my head now! Two thumbs up! The Pedro Pe character, the salsa fantasy sequence, the dancing down the grocery aisle, the head "chopping" to follow the fancy knife work of the great Pedro Pe was all hilarious! After most You Tube videos, I usually feel sad that I will never get back that 5 wasted minutes of my life. After your shrimp quesadilla video, I ran right away to show it to family and friends. You packed more good comedy into 5 minutes than the "Big TV Networks" can pack into their best 30-minute shows that are supposed to be comedies! Excellent video all the way around. I think you and "Pedro" have found your callings. Keep up the good work!